We moved Luke from public school to private last spring, and Ben made the shift this Fall. It's been a bit of a transition, particularly for Ben. As a public school kid, it was hard to get my head around at first, but it seems to clearly be the right choice for us. Glad to have both of them together, too. Luke had a Saint's presentation, and there are a couple pictures from that. 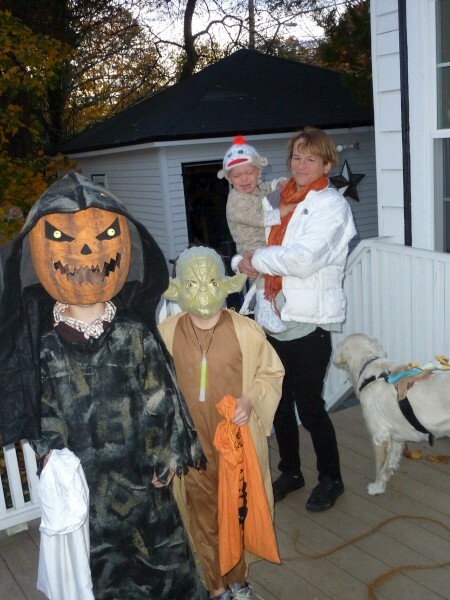 For Halloween, Luke was a scary Grim Reaper (that James was not fond of), Ben was Yoda, and James was a Sock Monkey. It was colder than usual that night, but the boys--including James--managed to bring home enough candy that we're still working through it. Luke's Squirt hockey team got to participate in the Bruin's 3-Minutes of Fame where they played a 3-minute intra-team scrimmage during the first intermission of the B's vs. the Rangers. Three minutes of hockey in front of 20,000 fans (10,000 were getting concessions or at the bathroom). Anyway, it was pretty fun for all involved, and he's had some pretty special hockey moments by the age of nine. Hopefully, he'll get it one day. For now, I'm appreciating it fully! Have a great holiday all!